The US National Transportation Safety Board (NTSB) is preparing to send a team of investigators to Russia to assist in the probe of a recent crash involving a Boeing passenger jet operated by FlyDubai. WASHINGTON (Sputnik) — The team will consist of two NTSB investigators, as well as personnel from the US Federal Aviation Administration (FAA) and Boeing, Williams said, adding the US team was scheduled to depart later today. "The NTSB is sending investigators to provide assistance," the agency’s public affairs officer Terry Williams told RIA Novosti. NTSB announced earlier that it was going to join investigators from the Moscow-based Interstate Aviation Committee (IAC or MAK) that are carrying out the inquiry together with the Russian Investigative Committee. 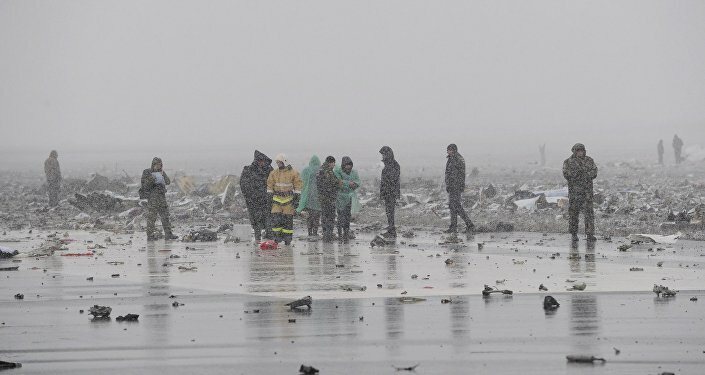 The FlyDubai Boeing 737-800 crashed on landing at Rostov-on-Don airport at around 3:50 a.m. local time (00:50GMT), killing all 62 people onboard, most of them Russians.